There is nothing quite like a picture perfect day out on the golf course. We make it easy to stay and play with our My Tahoe Golf Packages. 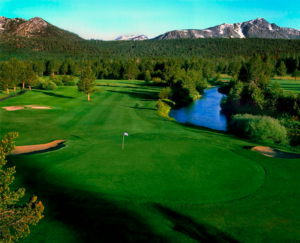 The Reno/Tahoe area is home to over 30 golf courses, any of which can be included in your package. The options are endless and just waiting for you! In South Lake Tahoe, within walking distance from the hotel is Edgewood Tahoe Golf Course, home of the American Century Championship, fondly known as Tahoe Celebrity Golf. 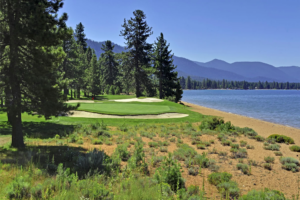 This beautiful course features picturesque views of Lake Tahoe with lush green fairways and is the only course right on the shores of the lake. Another favorite spot in town is the Lake Tahoe Golf Course, only a short drive away. This course is nestled in at the base of the mountains and along a creek creating featuring dramatic views of the Sierra Nevada peaks. Or, take a quick drive down to the Carson Valley for the Resort and Lakes Courses at Genoa Lakes Golf Club & Resort. Play one or even both championship courses during your weekend stay! With the My Tahoe Golf Package, not only do you get to pick your round of golf at any one of the 30 area courses, but you’ll also receive an instant quote and instant tee time verification as you build your package. All packages enjoy the same first-rate lodging in our comfortable two-room suites, complimentary breakfast buffet, and discounted happy hour beverages. Escape from work and enjoy a golf vacation during the week, or enjoy a weekend hitting the links. The packages are completely customizable. Still not sure where to start? Check out the “Ready to Go” packages for easy booking. 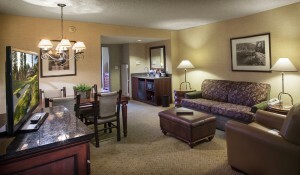 For more information and to book, visit our “Packages” page on the website. For additional activity and event recommendations, chat with our friendly team during your stay! As always, the best information resource for booking rooms is on our website at tahoeresorthotel.com for safe and secure bookings along with last minute promotional rates and details. Don’t forget to like us on Facebook, join the conversation on Twitter, start planning your vacation on Pinterest, or follow along and share your photos with us on Instagram to stay connected!